First Chance Farm is a five acre property located in Northern California, in the Sacramento Valley. Conveniently located, we have easy access to all major highways in the area. 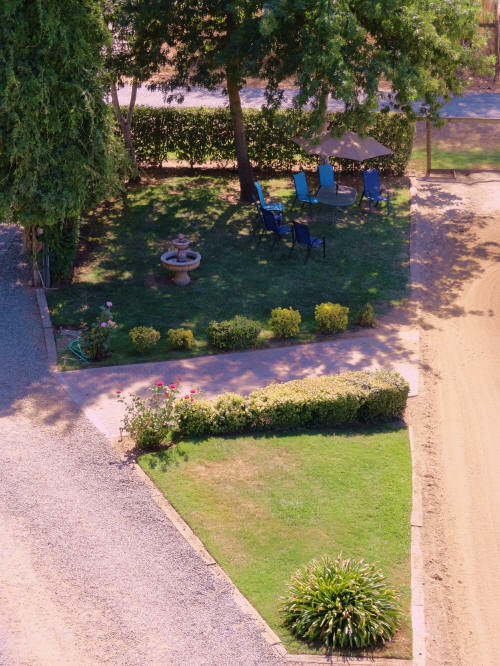 We are 15 minutes from Murieta Equine Complex and Starr Vaughn Equestrian Center, both premier show venues which host several major competitions each year, in addition to clinics and symposiums. We are also near many other show facilities including local schooling shows. We are 45 minutes from UC Davis Equine Hospital and within 15 minutes of four local Veterinarians. v Turnout Pastures with shade trees – all turnouts are hotwired to discourage playing with neighbors or getting caught in fence. Turnout offered 7 days/week. We believe that arena footing is vital to the success of our training program and we are committed to keeping our footing in the best possible condition. We have all the necessary equipment, including a water truck for quick and even watering. We harrow 6 days/week, and water the arena as needed. This is often twice per day in the summer, so that afternoon riders also have the benefit of a groomed arena. Heidi’s husband Geoff, in addition to his regular job, does excavation, builds arenas and is an excellent mechanic.